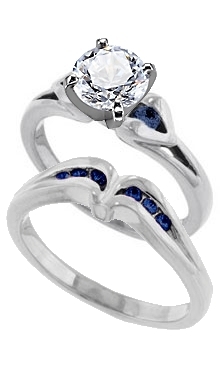 This is lovely 14k white gold set with blue sapphires. The engagement ring holds two 2.5 mm round sapphires. You choose the center stone from Danforth's inventory. The shaped band, contoured to fit snugly against the engagement ring, holds two 1.6 mm sapphires and four 1.5 mm sapphires.